Choose Equine Therapy First, Don’t Make it a Last Resort! Sometimes it is necessary for humans to seek therapy. Therapy being defined as “the treatment of mental or psychological disorders by psychological means”. 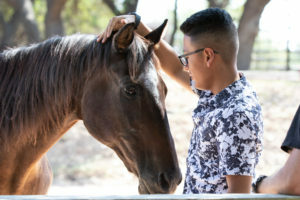 In that case, our licensed mental health professionals (LPC, LMSW, PhD) partner with trained and certified equine professionals to provide services to clients who are dealing with the symptoms of past traumas that often include anxiety, depression, eating disorders, post-traumatic stress, attachment disorders, situational stress, loss of a loved one, divorce or anything that causes a disruption in the ability to sleep, concentrate or in general thrive mentally, physically, socially, vocationally and spiritually. Our services include cognitive behavioral therapy, EMDR and many other methods recognized throughout the world for their efficacy in the treatment of psychological disorders. This is “real” therapy that is experiential, meaning that our clients actually experience instant authentic feedback, in a safe setting that provides the opportunity for the creation of new nuero-pathways in their brains. It is not a band-aid, a role-play or a quick fix. Activities taking place during therapy sessions are specifically targeted to therapeutic goals which are set during intake sessions and are re-evaluated throughout the process. Often our therapy teams work in tandem with Psychiatrists and other mental health professionals. This therapy is specifically targeted to the brain and nervous system for the purposes of targeting mental disorders. Any riding that is done is for those purposes alone, given that the motion of the horse’s movement is passive regulation and it is helpful when aiding clients in learning self-regulation and targeting areas of the brain that may be “offline” and need regulating. True fulfillment and joy come when we are fully engaged with the world, not retreating or hiding from it. 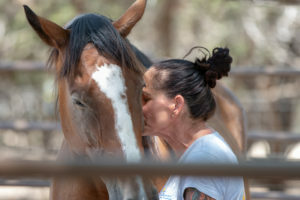 Horses show us that true connection comes when we fully accept ourselves and find power in the realization of our identity. Horses see us for who we are and wait for us to do the same thing. Click here to go to the Therapist page to visit their web sites and make an appointment. 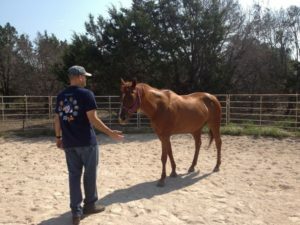 Now, what does it mean when trauma is introduced into the discussion of mental health and equine assisted therapy? Essentially when “bad” things (war, car accident, hospitalization, unexpected death, divorce, abuse) happen, our brains and nervous systems react – fight, flight or freeze. Cortisol and adrenaline flow to provide stamina to survive the stressful situation, enabling us to run away or go into a state of disassociation. We actually need our brains to do this in order to keep us alive and safe. However, there are times when the human brain has to adapt to repeated perceived or real threats to our lives and/or well-being, and in order to keep us “safe”, we develop maladaptive, or unhealthy, coping mechanisms. These include disassociation (checking out), quietly meeting everyone’s needs (staying under the radar), aggression (distraction), inappropriate overreaction (anger/fear/fight) and more. In addition, repeated threats and traumas cause a loss in the ability to appropriately react to certain stimulus, (sounds, smells, people, situations, emotions) and “triggers” develop that set into motion actions and out of control emotions. These triggers cause inappropriate and uncontrolled reactions to perceived and real threats and actions by other people and situations, and can damage relationships, affect the ability to work and affect quality of life. These include dysregulation in terms of emotional outbursts, and an inability to control emotions and thoughts, checking out, nightmares/flashbacks and repeated unhealthy behaviors that numb us to experiencing sadness, loss, anger, fear and helplessness (drinking, drugs, self-harm, promiscuity etc.). At the time we are experiencing trauma or stress, these reactions may be appropriate, but over time without intervention, they can inhibit and even ambush our ability to create sustained healthy connected relationships while keeping our nervous systems in a constant state of fight/flight/freeze or what we call a hyper-vigilant state. These old and well-used coping mechanisms, often from traumatic events and even past relationships, become default mechanisms and without even realizing what is happening, the subconscious mind take over and moves the mind and body into a space that changes the ability to openly and honestly interact with others, cause us to struggle with creating and sustaining relationships with our peers, partners, children and even strangers and even hold down a job or sleep. Often depression and a feeling of isolation, helplessness, hopelessness and being “stuck” develop and seem insurmountable. In situations where trauma continues, clients tend to notice panic attacks, loss of memory, increased heart rate and blood pressure, insomnia, stomach pain and headaches. The good news is that the brain is incredibly malleable. It can heal and learn better coping mechanisms and learn appropriate responses to stimulus. With help from a qualified licensed therapist, the brain of the client can create new nuero-pathways that lead to healthier and more appropriate responses to stimulus in our environment, aid in creating and sustaining healthy relationships, re-connect to intuition and creativity and even develop the ability to allow our nervous systems to rest and relax. This re-connection to self has been described as a light coming on and a sense of weight being lifted. The symptoms of anxiety and depression gradually lessen and eventually can disappear altogether. The ability to live in the moment, recognize when triggers are causing a physical sensation and emotional reaction and learn regulation is vital to creating those new pathways. The horses are necessary for this process because they instantly react to humans living in the moment, being authentic and recognizing current emotion. Emotions do not cause them to fear or reject us. It is when our emotions are ignored or pushed aside while pretending to be okay that cause us to not feel safe to them and they will ignore or resist our requests to interact. Similar to a wolf in sheep’s clothing, our insides have to match our outsides. If anger is being felt, or sadness, and layered on top of that authentic emotion is a fake smile, is causes unease and distrust. Emotions and feelings are part of the makeup of the human nervous system and so learning how to recognize what these sensations are communicating is a skill that humans must have in order to learn the ability to self-regulate and appropriately respond to the stimulus. Slowing down and identifying what is happening is the first step, realizing what is happening and responding if needed and then going back to a state of calm is the goal. Without achieving this state of calm, it is almost impossible to relationally connect to other humans or think clearly and make decisions. Go to our contact page to request additional information on our program.